Regular readers of this blog will know why I bought this set. Suffice to say I bought it for a Reason. It shall ultimately be used for that Reason. But I will not discuss the Reason here. This set is part of the 2016 Creator range, released in December 2015/ January 2016/February 2016, depending on where in the world you are standing. One of the two ‘second lowest price point’ sets in the Creator 2016 range, this set advertises three builds in one. Now we should know this means ‘three sets of builds with instructions, but what you do with it outside of that is your own business so really the opporutnities are endless.’ On this occasion, the builds are all aeroplanes. The set comes in a small box, and is modestly priced ($AU15.99, $US9.99). The box features all three models on the front of the box, with the hero ‘swing wing’ leading the way, and the others in smaller callouts on the right hand side of the box. The set is rich in Flame Yellowish Orange, White and Bright Blue, which is reflected in the colouring of the box. There are a number of interesting elements in light blueish grey, as well as some small transparent pieces, in a variety of colors. The set allegedly has one hundred pieces: 10c/piece in the US, but a less than flattering $AU0.15 over here. There are a number of interesting (please note – my idea of ‘interesting’may differ from yours) pieces in this set including FYO/BLO brackets and tail fins, which are exclusive at this time to this set. The other particularly uncommon piece is the blue 2x2x2/3 bow. Also present are 2 1×2 modified plate with 2 shafts: only released last year, but now appearing in 22 sets. There are many different wedge plates present in this set, which allows the variable wing configurations seen in the designated builds. One is a single wing, dual engine model. I liked the use of the brackets and 1×2 cheese slopes to form the engines. The piece count was low, using around half the pieces in the set. As a plane it was fun to swoosh, but not as much fun as the other two builds. 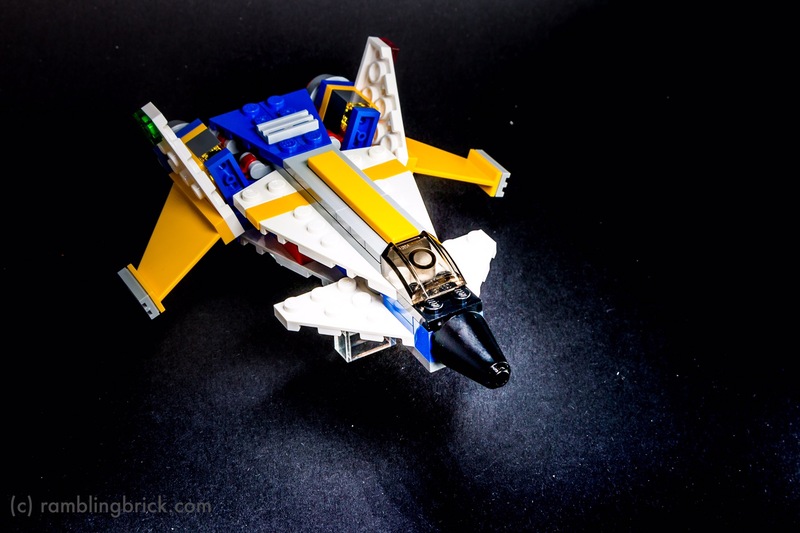 The second build features a canard (fore-wing) with forward sweeping rear wings. It may draw inspiration from planes such as the Sukhoi Su-47. With wings that would tilt downwards, along with rotating the tail fins outwards. It looks like a plane with only one speed in mind: jolly quick! This model used up around three quarters of the pieces in the set. The use of clips and bars for the tail plane attachment was interesting, and could be quite useful in the future to adapt for other purposes. The hero model featured on the box is a swing wing jet, with dual tail fins, somewhat reminiscent of a Grumman Tomcat F-14 or Mig-29. However, as LEGO does not make realistic models of actual military vehicles, this set must merely just draw inspiration from them. This model is put together in a modular fashion: mid section, nose/cabin, wings, tail section. The wings cryptically attached to the discs of 2×2 turntables and have a single clip on the trailing middle corner of the wing. This is attached to a 2×1 plate with 2 bars. In turn, this attaches to the tail assembly, with a satisfying click, (or clic as described in the instruction book). Pulling the tail section out swings both of the wings out, and pushing the tail in sweeps the wings back. A great play feature, with moving parts and NO TECHNIC ELEMENTS! This build shows that clips and bars are designed to have a relatively kinetic relationship: the connections stand up to repeated stress and movement and for me, was almost worth the price of admission on its own. There are some small panels that act to limit drift of the plates as they slide back and forth. So… How does it shape up? This set has a couple of exclusive pieces, as discussed earlier. 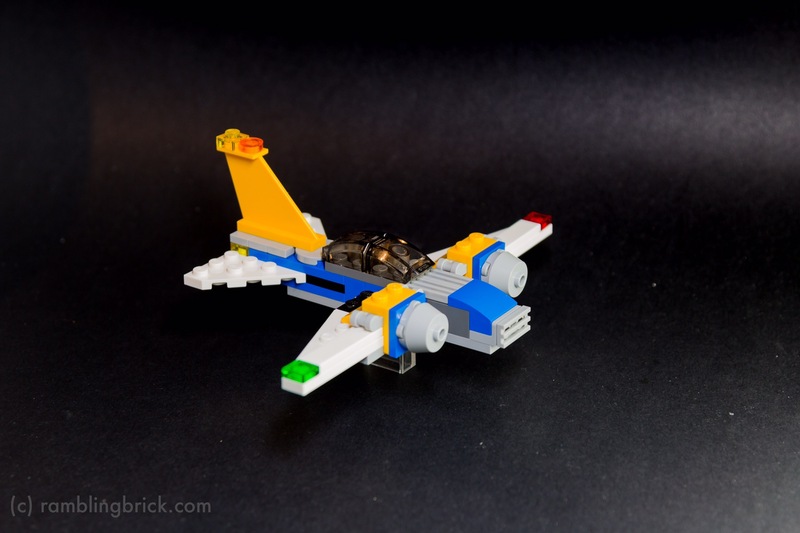 One, the tail fin, is the closest alternative to the regular orange featured in the first Lego cuusoo set( precursor to Lego Ideas) – the Shinkai 6500 submarine. So it could be a reasonable alternative for anyone not needing to spend $1000+ on the aftermarket for the original model, or around $au100+ on the tail fin alone, albeit in a slightly lighter colour. I appreciated the way that the hero model was built in modules, that were then secured onto the main fuselage. This is quite a nifty approach to vehicular builds, which I think I will adopt in the future. The model is extremely swooshable, and has a great play feature, with the swing wings linked to the tail plane, not to mention the particularly neat price point. I was a little disappointed by the monoplane model, but I feel that’s just petty when it wasn’t in my top five reasons for buying this set. I’ll give it four out of five arbitrary praise units. Are you more knowledgable on airplane designs than I ? Chances are you are. Which planes do you think served as inspiration for the builds here? As for the Reason: that shall be revealed soon enough.